You might be asking yourself, what do these television shows all have in common? Beside the fact that they are all great shows to watch, they happen to be Finley’s favourites. When I was pregnant with Finley, I can remember getting into some pretty interesting conversations with moms about their children. They always wanted to give me advice (unsolicited of course). One mom I talked to asked me “what kind” of child I was hoping for. I assumed she meant boy or girl and I said the usual thing that most parents say, “I just want the baby to be healthy”. She looked at me funny and said, “Let’s hope you have one of those kids that you can just sit in front of the television and they will stay there. It makes things much easier.” She then started to talk about the difference in her two children, how one was “able” to sit in front of the television (9 months old) while the other one would never sit still (3 years old). Seeing as both my partner and I love to watch television, this became quite the task. I wouldn’t say that we watch a lot of television, but we certainly had our favourite shows. So, during her first year – Finley didn’t watch any television. We didn’t even want her in the same room as a television that was on. When Finley got to be around 14-15 months old it all changed – slowly but surely she started to “watch” television. Finley had fallen asleep on the couch one day so we took the opportunity to watch an episode of Glee that we had previously recorded. I guess the music woke her up and she looked at the TV in amazement. What was this bright and colourful box that made wonderful sounds? She stared at it for a while. My partner and I looked at each other,“She’s not supposed to watch television until she is 2 years old” I said. Then Finley got so excited and started to dance. She seemed to be mimicking the dancers on the show. You could tell that she loved the music – it connected with something inside of her. From then on, we all watched Glee once a week. Finley continued to dance around the living room – coming up with different movements each week. We figured…once a week…that can’t be that bad…can it? We worried that we were causing some sort of cognitive problems in our child…would she be delayed in school because we let her watch Glee. Would it be all over the papers, “Parents Let Child Under Two Watch Glee, Causes Brain Delay”. Then I remembered a child from one of the daycares I had worked at. Her family didn’t believe in watching television – she had never really seen one. The staff decided to have a movie day to celebrate the end of the year and we were watching some Disney Film. The parents were fine with their child watching a movie with all her friends, but they weren’t sure how she would handle it. She seemed very excited to be in a dark room with all her friends, waiting for the movie to come on. The movie started and I can still see the look of sheer PANIC on that child’s face. She got so upset that she ran from the room and refused to come back. She stayed in another room for the rest of the movie, playing with blocks and puzzles – but missed out on an opportunity to be with her friends. Afterwards, all the children were talking about the movie and this little girl was left out of the conversations. I felt bad for her and wondered if eliminating all television had really benefited her in the long run. We didn’t want Finley to be babysat by the television, but we also didn’t want her to run screaming from a room when a television was on. We decided that there needed to be a balance. After the season of Glee ended, we thought it might be good to introduce her to some educational programs for children (there aren’t that many out there). We showed her a few episodes of Sesame Street (once a week) and she was hooked. Here is Glee on Sesame Street – the best of both worlds! 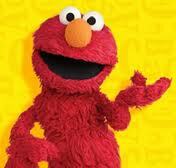 Elmo is her favourite character – what’s not to love about Elmo! He is a bright red puppet that is full of laughter and love. Then came the Golden Girls. Yes, that’s right – the show about 4 old ladies eating cheesecake. I happen to have the whole collection! Finley found one of the DVD cases one day and started to ask questions about it (in her own little way). I pointed out all the characters and explained that they were all actors that had roles on the television show. We showed her one episode to see what she would do…and she loved it – I mean looooooooved it. 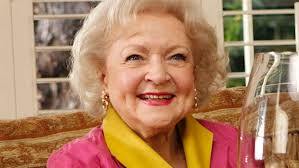 Her favourite character is Rose (Betty White) – what’s not to love about Betty White? She is a bright shining light, full of laughter and love. At this point, Finley probably watches television every other day for about an hour. Sometimes Sesame Street, but it is usually the Golden Girls (hilarious, I know). It is important to note that Finley doesn’t watch it by herself – it is something fun that we do together as a family. We try not to feel guilty about her time spent in front of the television and for all those parents out there who allow their children to watch some television – you shouldn’t feel guilty either! Television is a part of our society, they are found in most homes. Most living rooms are designed to have the TV be the focal point of the room – all of our furniture faces it (this is the bigger concern for our society in general…but that is probably not going to change). So, moderation is the key. I still believe that television has no educational/entertainment value to any child under the age of one and many children under the age of two. They are just not at a cognitive level that allows them to process all of the different messages, images and signals. However, if your child is between the ages of 12 and 24 months and you feel that they are “ready” to watch television, test it out. Do they interact with the program that they are watching? Do they point and seem to want to know more about what they are seeing? Or, do they stare blankly at the screen? If they are not really showing any interest in what they are watching, they are not ready. Finding a balance can be hard, but as your children get older, television will most likely play a role in their lives. Make sure you know what they are watching, which is a whole other blog post, and limit their “sedentary time”. Television isn't all bad…especially if you're watching Sesame Street, Golden Girls and Glee, just ask Finley!